animals over millions of years. The remains were buried in sediments which excluded the air (kept out oxygen) and stopped them decaying. More sediment buried the remains deeper and deeper until pressure and heateventually turned them into coal, oil and natural gas. 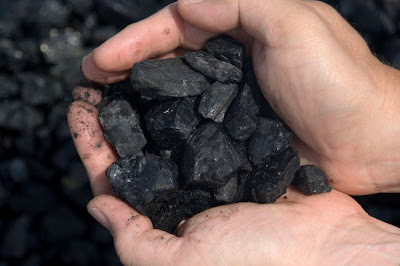 They are called fossil fuels because they are buried underground(from Latin fossilis - dug up). Fossil fuels are a finite resource and non-renewable. The oil deposits are formed in porous rock sediments. Porous rock has pores in it. Pores are small holes (see for example sandstone).The small holes allow the oil and natural gas to pass through the rockand rise until they are stopped by a layer of non-porous rock. Non-porous rock (for example shale) has no holes,and acts as a barrier to prevent the oil and natural gas rising.The oil and natural gas become trapped underground. The oil is called crude oil (or petroleum, from Latin - rock oil),and has natural gas in it or in a pocket above it trapped by non-porous rock. Drilling through the rock allows the oil and gas to escape to the surface. Natural gas is mostly methane (CH4).Crude oil is a mixture of substances (mostly hydrocarbons). You may not be aware that material from www.gcsescience.com has been reproduced without permission on your blog. Permission to use copyrighted material is not unreasonably withheld but it is important that you get it in writing to protect yourself from future legal proceedings. You can email info@gcsescience.com to make a formal request.